Electric eel. 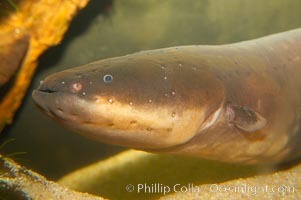 Like other members of the South American knifefish family, the electric eel relies on electrolocation to navigate in find food in murky water. However, its electric organs are more powerful than its relatives, allowing it to produce sufficiently high voltage pulses to stun predators and prey. Electric eel, Electrophorus electricus Photo.